Last night, Catherine Freshley came by to hang her art at Clarity, and it's remarkable how it brightens our space. 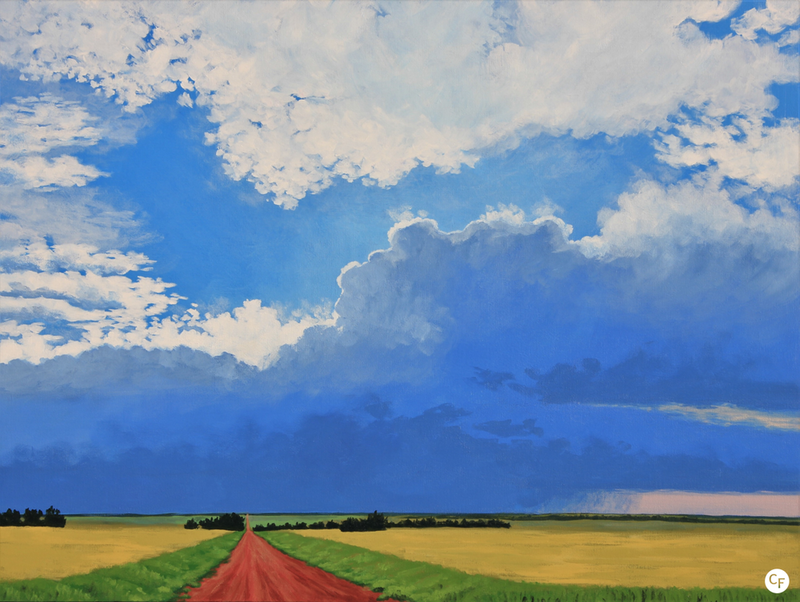 The paintings feature landscapes, plains and big skies, a look at Oklahoma from a Portland native. I heard Catherine say in an interview on Enid City Connections that when she moved to Oklahoma she was "overcome by how flat it is and how huge the sky is." This is the inspriation for her landscapes. I asked her a bit more about it: "My paintings always have a low horizon line -- I like that from a composition perspective and I am just more interested in the sky than the land. I want my paintings to be plausible, but I'm certainly not going for realism; more than all the details of the grass or painting a cloud that is scientifically accurate, I want to capture what it feels like to be out in these beautiful, open spaces." Catherine paints from photographs she takes while out on the open road. She considers her paintings a documentation of the passing beauty of a moment in nature. "I feel compelled to preserve our beautiful, everyday scenes by painting them. The way I see it, I am just using a skill that I have to translate a fleeting moment that has already been created (by Mother Nature, God, whomever) to something more permanent. I think for that reason, I don't get attached to my paintings because I don't feel that they are of me." Catherine moved to Enid three years ago, and says it has been great for her art career. "I have clearly been inspired by my surroundings" she says. We asked a little more about Enid, obviously jumping to our favorite question: "We have one Starbucks and two local coffee shops." She frequents Five80 (where our friends at Copper Tap roast) and DaVinci's. She says, "They are both super supportive of the community and both have a nice atmosphere and, of course, good coffee." Sounds like our kind of people. Catch Catherine Freshley's art here over the next two months. Take your time and enjoy it.